pasta dinner | Crappy Kitchen - Good Dinners! If you are looking for a rich meaty bolstering dinner, then here it is! I found some great Australian ground lamb on sale and snapped it up. Some people find lamb too rich, but when you simmer it with complimentary spices and add some good toothsome pasta, the richness feels right. If you have a crowd coming over for dinner and don’t want to kill yourself cooking, then this is a pretty great way to go. It is not a bit laborious and you can sit down at the same time to eat as everyone else. 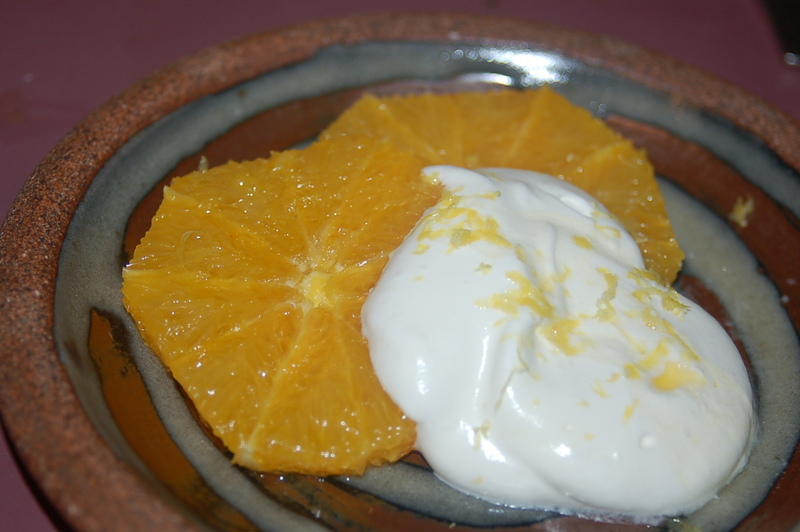 And for dessert, go with something equally simple: Oranges and Cream! So call up a few friends and make it happen! 1 – Put large saute pan or shallow casserole on medium heat (large enough to hold completed dish) and add about 2 tbs olive oil. When it has warmed up, add the onions, mushroom and garlic and cook, stirring occasionally, for about 5 or so minutes. 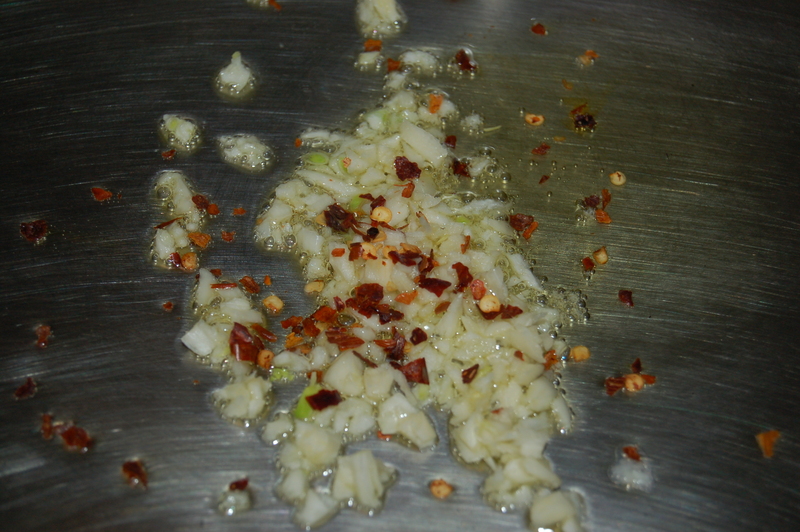 2 – Add all the spices (oregano, paprika, cumin, chili flakes, salt, lemon zest) and continue to cooking for another 5 minutes. Turn up the heat a little if you need to. 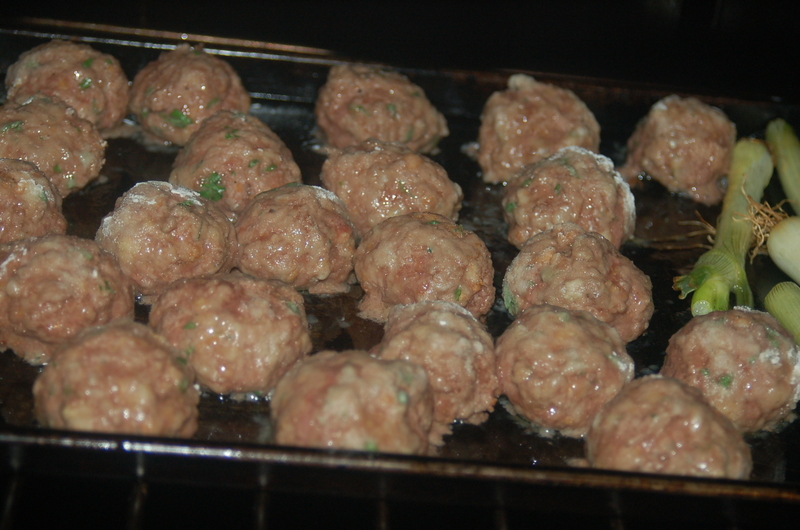 3 – Add the lamb and break it up and incorporate into the spice mixture. Turn the heat up to high and cook the meat, stirring often, until it begins to brown all over. 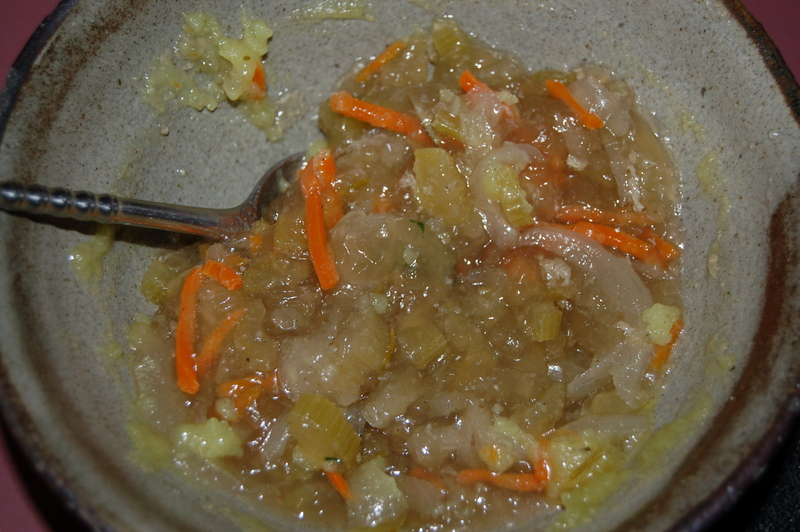 4 – Add the carrots and the tomato paste and stir. Cook for another 3 to 5 minutes, letting the flavors meld. Add the stock and when it comes to a bubble, turn down to a simmer and cover. Cook for about 12 to 14 minutes. Taste and adjust seasoning, adding more salt to your taste. Add the lemon juice. 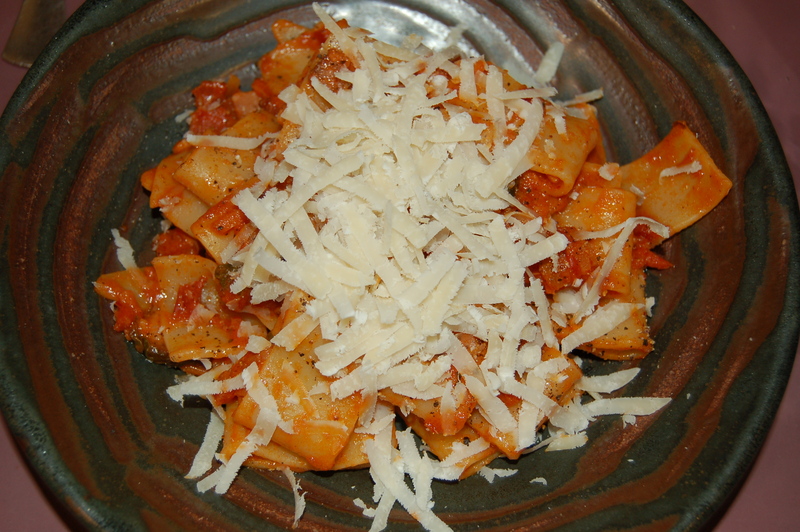 5 – Add the drained cooked pasta directly into the sauce and stir. Stir in the yoghurt and add some of the pasta cooking water if you want a looser sauce. Serve family style in a big serving bowl in the middle of the table with a nice crispy salad and more yogurt, and possibly hot sauce for anyone wanting some extra zing. Or divide between warmed bowls or plates and let everyone add a condiment or garnish according to what they like! Some nights I crave (in the biggest possible way) something like this! It has to be pasta, and that pasta has to be weighed down with something rich and luscious. There is no better combination of flavors and textures then a meaty pasta and sauce, (and of course a glass of good wine completes the picture of what my craving looks like!). I discovered a new dry pasta that I have become addicted to, and look for ways and excuses to cook it as much as possible. When I was shopping in the pasta section of the infamous Eataly (read more on this wonderful Italian market HERE and HERE and HERE and HERE!) in NYC the for the very first time, I had never seen so many varieties of pasta since being in Italy. I choose a few different brands to try out and my very favorite was the Rigorosa brand. 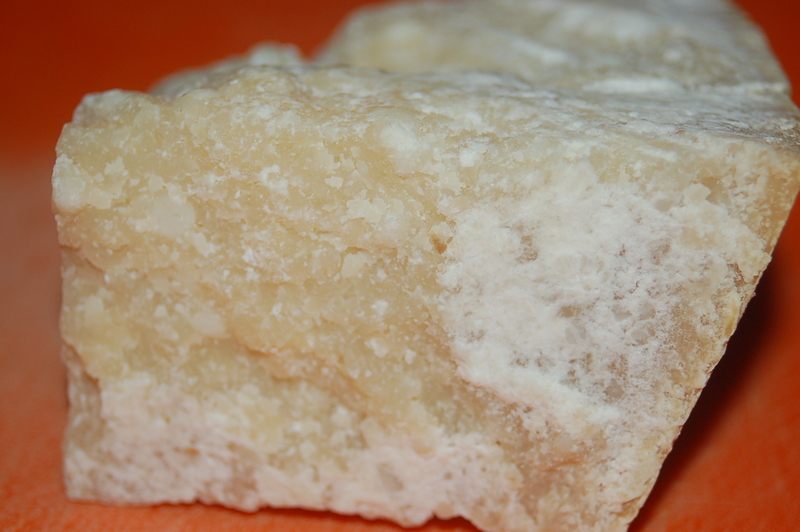 It is dense and chewy in the best possible way. I now stock up on it every time I visit, but since I eat pasta more than I go to NYC, I was very happy (and surprised) to discover that my mediocre supermarket stocked another brand that I also bought in Eataly. 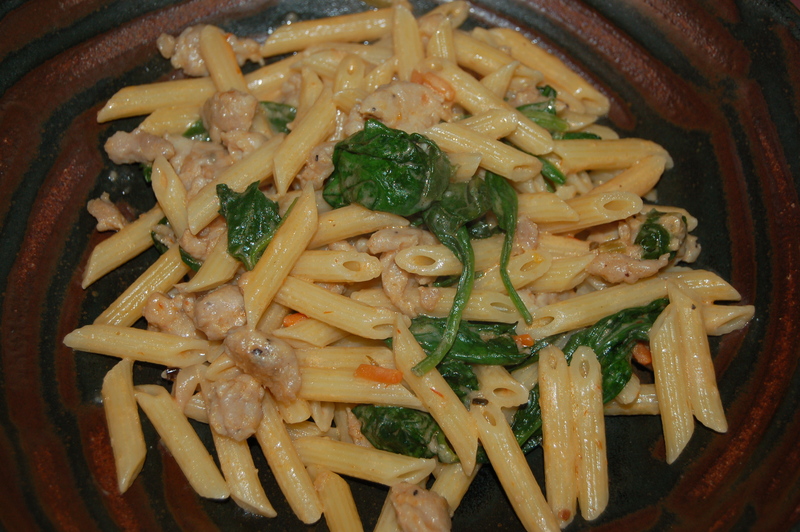 It is made by Garofalo and my favorite is their calamarata pasta, (or calamari pasta – aptly named!). It sops up sauce like no other and has a great toothsome bite. There is nothing remotely wimpy about this pasta and I would feel confident serving it to a table of hungry giants. 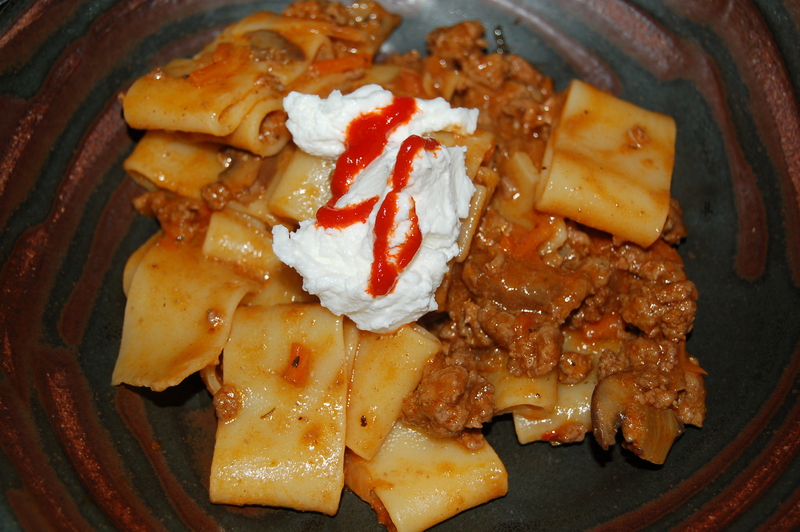 It handled this ragu marvelously, and if you can scour out a good thick-ringed brand of pasta like this, you should try the recipe too. 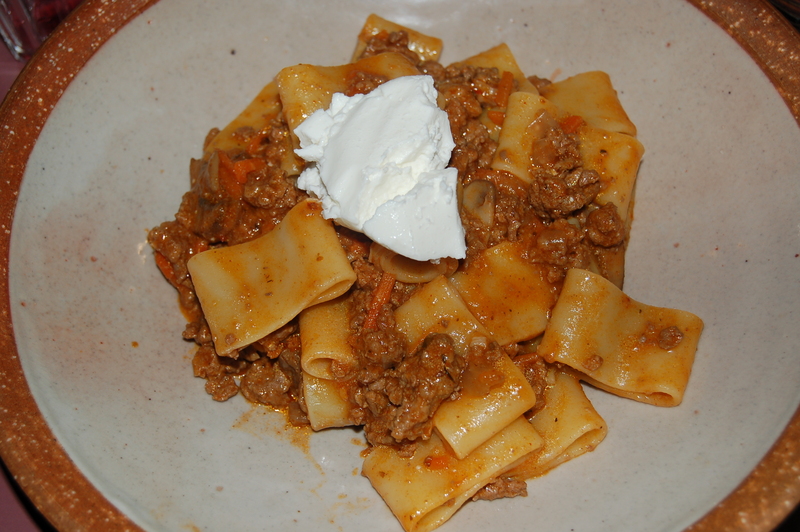 It is served with a ragu, and this one, as with most of the ones I end up making, was determined but what I had to go with my big can of tomato puree (and you will see, I didn’t have much!). 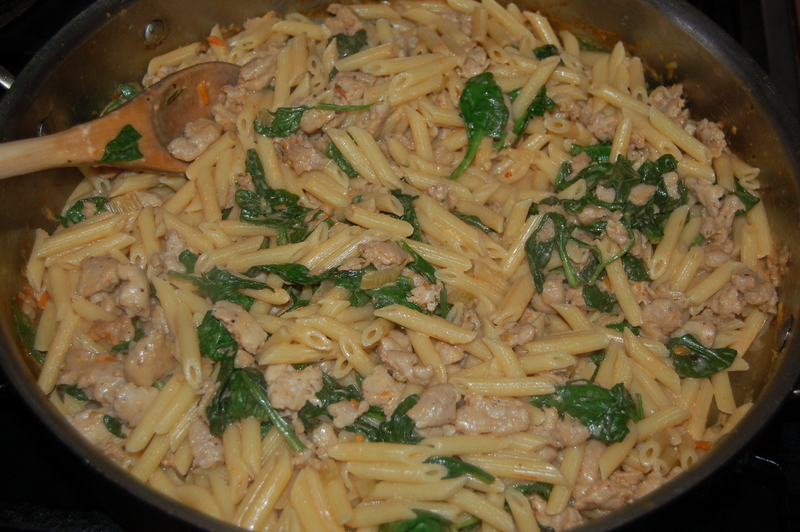 It was simple, but bursting with flavor and there wasn’t a scrap of leftovers! 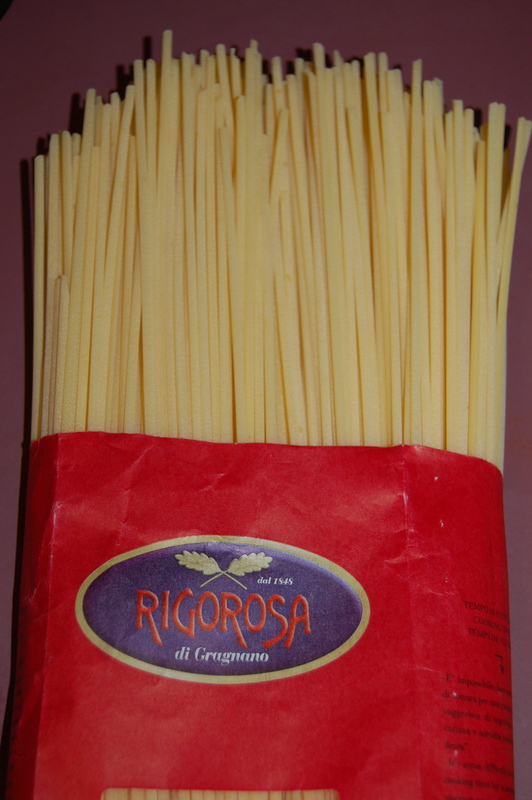 1lb good quality big tubular pasta like Rigatoni or calamarata. A big shell type or fusilli would be great too. 1 – Put the oil in a big saute pan (big enough to hold the complete dish) and on a medium heat. Add the onions and cook for 5 minutes, stirring occasionally. 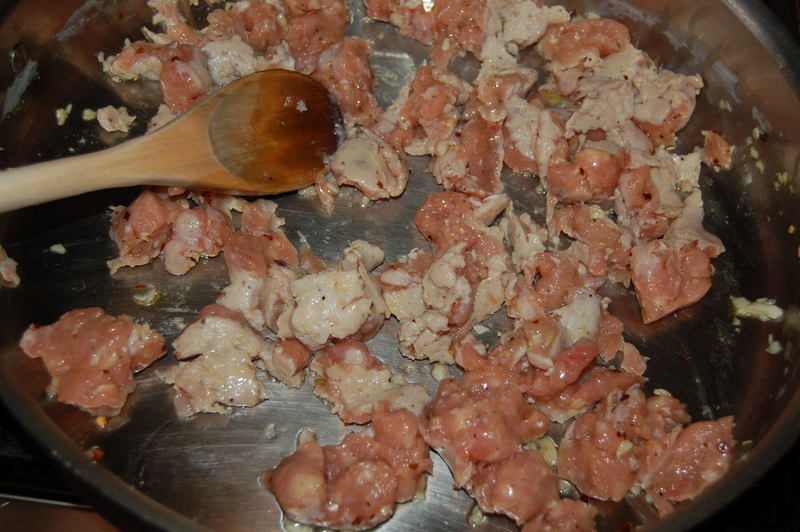 2 – Add the chopped bacon and turn heat up to high/medium. Cook until bacon starts to get crispy (could take up to 15 minutes), stirring frequently. 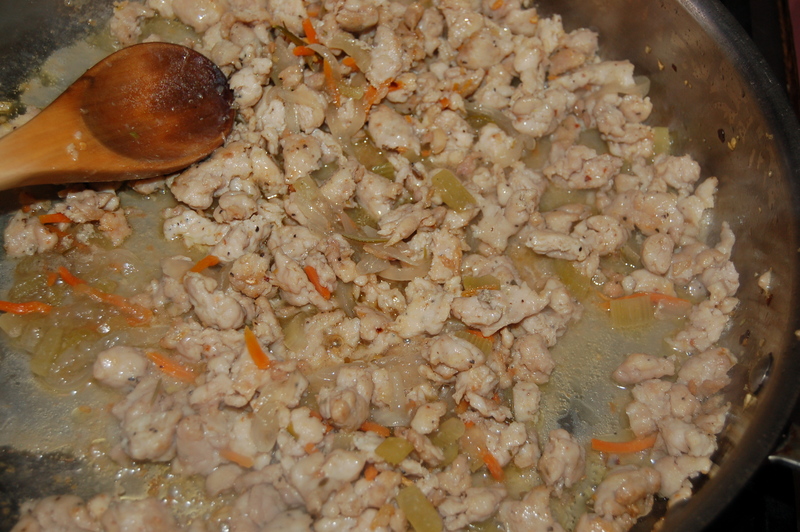 3 – Add the butter, carrots and tomato paste and cook for about 7 minutes. Add the wine and cook until half of the wine evaporates. 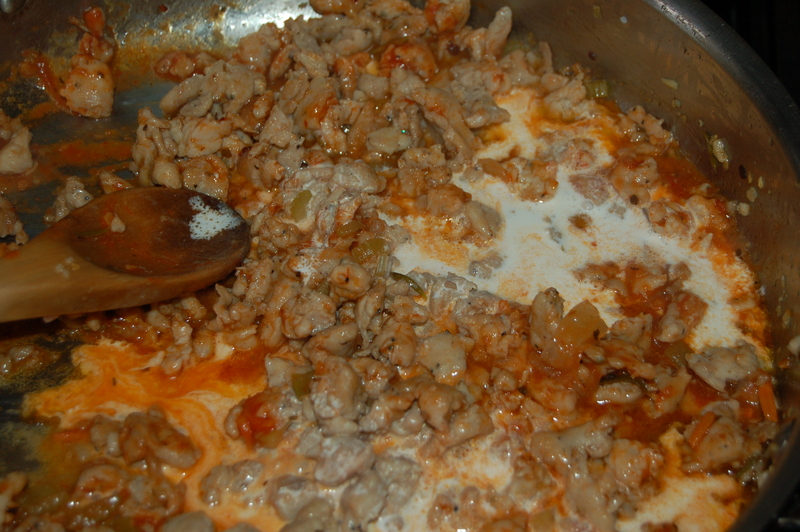 4 – Add the tomato puree and stir. Bring to a boil, then turn the heat down to a simmer. Cover with lid and cook for about a 1/2 hour. 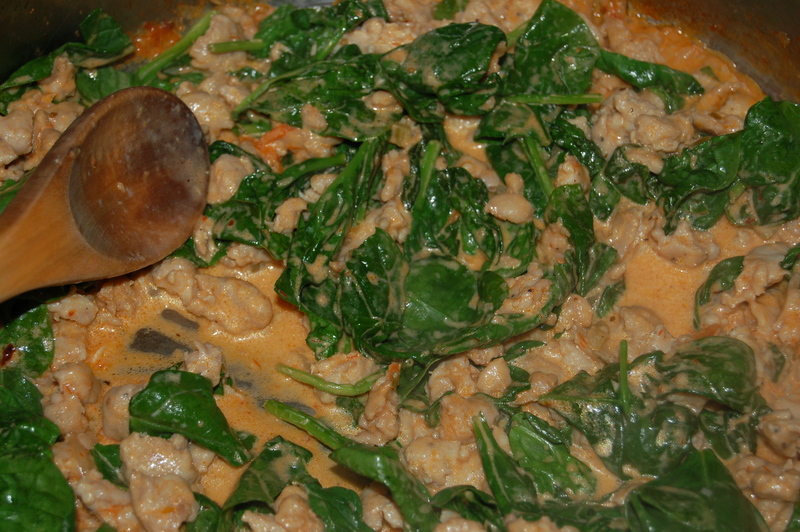 5 – Add the milk and continue to cook for another 15 minutes, stirring occasionally. 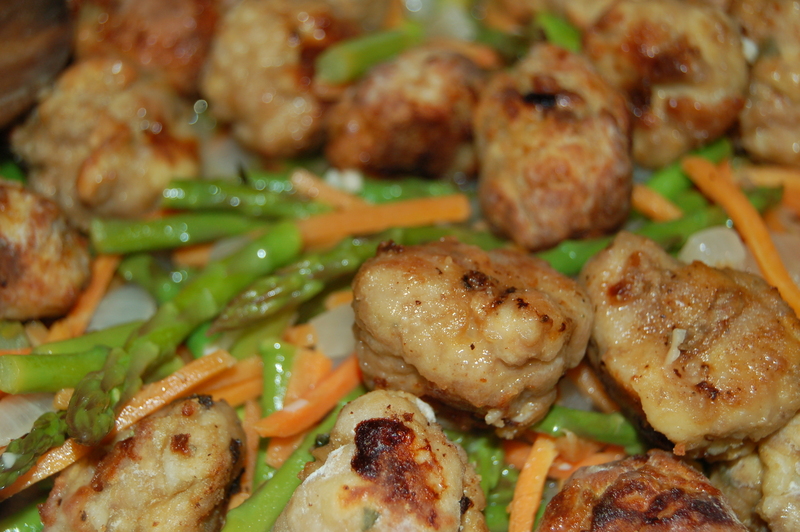 6 – Taste sauce and adjust seasoning with salt, pepper and a little cayenne pepper flakes if you would like. Add the cooked pasta and stir gently. Add some hot pasta water if you desire a “looser” sauce. 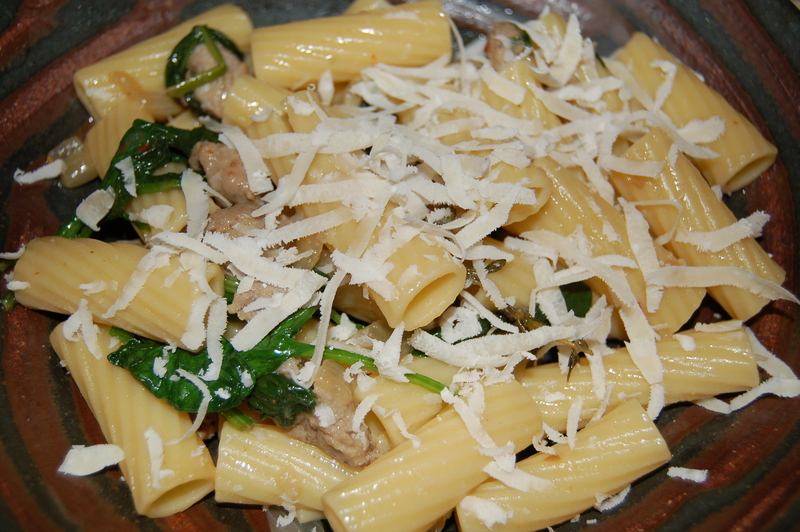 I served this with a good grating of Parmigiano Reggiano but you can eat it alone or with whatever you like! I asked my sister-in-law’s husband Bob to invite us to dinner! I never know how to introduce him; he is married to my husband’s sister and is “Uncle Bob” to my kids. But he is not technically my brother-in-law so do I say” hi, this is my sister-in-law’s husband” or “this is my husband’s brother-in-law” or “this is my kids uncle by marriage” or perhaps just “this is Bob” would be best. Yes, except that when you introduce people everyone needs clarification to feel comfortable. Like, “this is Mimi, my sister who lives in Ireland and thinks her winning dish is corn flakes with the perfect measure of sugar and milk” That way you know that this person is my sister, you know where she lives and that she cooks a mean bowl of cereal! People are more comfortable when they have a little information on someone new. Try going to a party and introducing someone by just saying their name and watch the awkward moment that follows! I guarantee the next question asked by the person left out in Limbo will be: “what do you do?” or “how do you know Tess?” We are odd insecure creatures. So who is Marie now that you know Bob is my sister-in-law’s husband, my husband’s brother-in-law and my kids Uncle by marriage, oh and lives right next door. Marie is a person I never met but someone I have heard about over the course of 20 years, and in that time have pieced together a picture of this woman, Bob’s mother. It is just what happens, the way that I have a nostalgic urge to continue to cook certain foods my mother cooked and not the food my mother-in-law cooked. It is the root of things that cannot be severed or relinquished. The piece of Bob that is integral to his make-up is the food that his mother made and the food he learned to cook himself through what must have felt like osmosis to him. The day in and day out of just being in the kitchen with her (whether he was helping with the meal or not), taught him how to cook her food. The familiar aroma that seemed to hang in the air of only his house became an association with her and her alone. When you grow up in a house where cooking is a nightly occurrence you can’t help but take that with you when you leave or when the parent who created all the smells and tastes dies. That is a very beautiful thing. And it is that part of Bob’s mother that is very much alive for him. She grew up in an Italian/American household, lived in an Italian neighborhood in Newark New Jersey and married an Italian/American man who was from the same town (correct me if I am wrong Bob!). To me, the great thing about Italian food in American is how these expats. took the best of what their forbearers brought with them and held on tightly to those recipes. 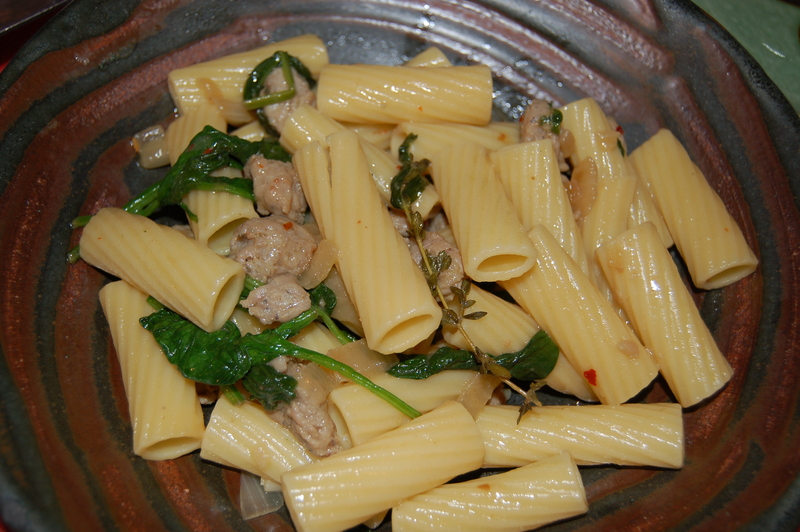 They made it their own of course but the backbone of certain dishes is very much Italian; like Sunday Gravy. Italy is one of those amazing places in Europe who is stubborn (in a very good way) about their food. They have not been lured by “fusion” even though the world itself has been fused together with people and countries mingling together creating a new kind of food culture and new kind of world in general. When I lived for a few months in Italy last year the only food I ate, indeed the only ingredients I could find to cook with in the little Tuscan town (Cortona) I lived in was Italian food; all of the meat, the sausages, chicken, lamb, beef and all the mouth-watering cured meats were all local, as were the vegetables and of course the wine – all Italian! You could find a little more diversity in the big cities like Florence and Rome, but even their traditional Italian food reigned supreme. 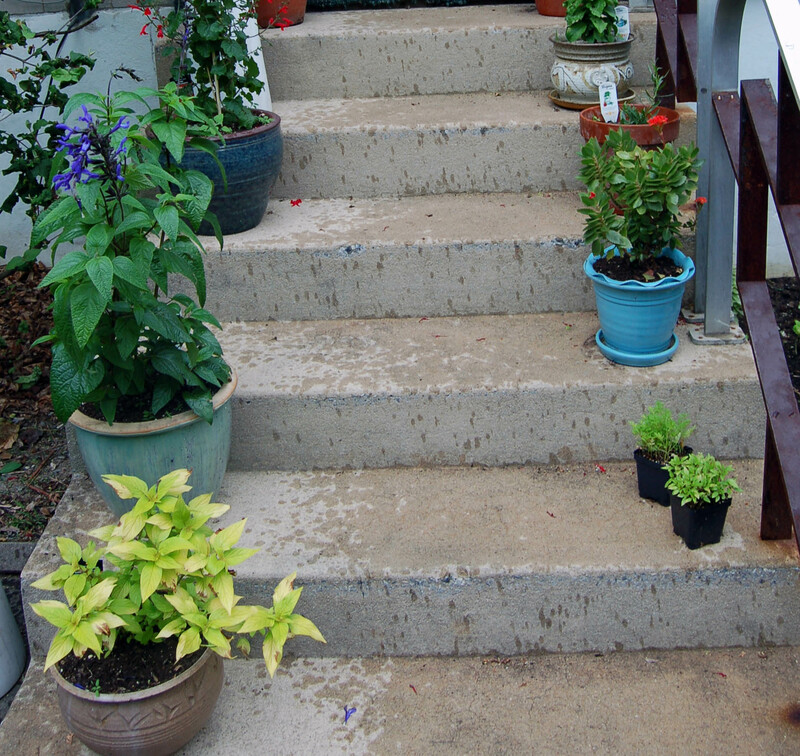 I did not complain (although I did pine now and then for some soy and sriracha sauce!). Getting back to Bob…a few weeks ago I bumped into him when he was waiting for his daughter (my children’s’ first cousin or my niece by marriage who is also my God Child – just to clarify) and I asked if he would make his mother’s Sunday Dinner and invite us. Brazen I know, but after 20 years I felt like I could ask and that he could go ahead and be a bit indignant that I had the nerve but I really don’t worry too much about stuff like that any more. And to be fair, Bob is a pretty easygoing fella so of course he willingly agreed to make dinner for us all! He sort of laughed and said it wasn’t anything special but a week or so later his wife (my actual sister-in-law!) called to say that Bob would be making “The Dinner” this coming Sunday – wow, he took my request as a serious one after all. When you have the same dinner each and every Sunday for as long as you can remember then I suppose this dish is viewed as nothing special. I mean if I lived in Italy and had a cornetto and a cafe macchiato every morning for breakfast it would also become something ordinary ( I can only dream about that kind of ordinary right now). It is all relative, and since I grew up in Ireland on a diet of meat and potatoes the idea of eating pork tenderloin, homemade meatballs and sausages that have been simmering all day in a rich red sauce and served with rigatoni pasta and a generous sprinkle of freshly chopped flat-leafed parsley, Parmigiano Reggiano and possibly a dollop of ricotta cheese seemed like a most glorious opportunity indeed. 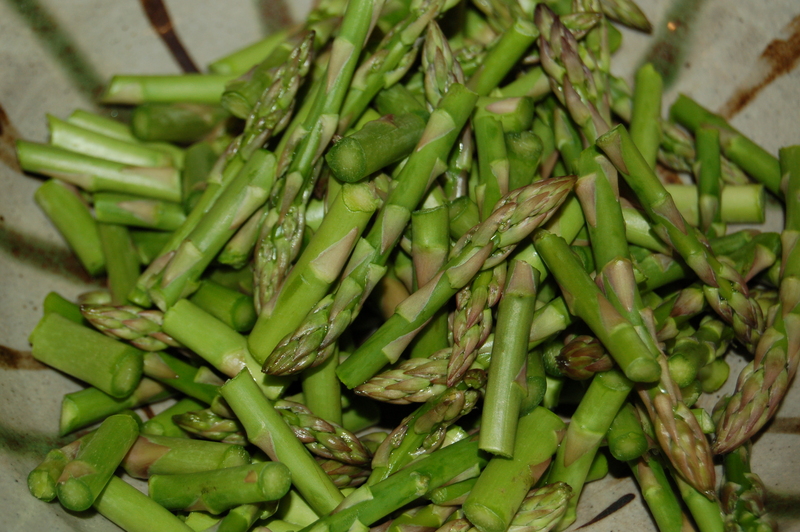 I had never experienced anything close to this kind of food growing up in Ireland. Loath though I am to admit it the first time I ate spaghetti with red sauce was from a tin. It never occurred to me that you could eat it any other way. I had never seen dried pasta in the supermarket namely because it was not sold in any supermarket in Ireland before 1983 ish. I’m guessing on the date but to impress upon you how rare it was to find pasta and even rarer to find someone cooking it instead of potatoes, I remember being in a very fancy supermarket in Dublin in about 1984 and in one aisle there was a whole shelf of dried spaghetti with a big SALE sign that said 1 penny! So even the supposed sophisticates of the country had no notion what to do with the stuff! When I took some home and cooked pasta for dinner, my father said “this is great but where are the potatoes?” After that I always served pasta with a dollop of mash on the side. Even today, in every Chinese restaurant in Ireland you can have chips with your Beef Chow Mein! Which reinforces the idea that even though the world has immersed itself in each other’s food we tend to stick to what we grow up with for the most part. Why do you think that Bob was still cooking a deep rich red sauce with his mother Marie in his kitchen in Newark in the 70’s and 80’s, which of course was handed down directly from some relative who came over from Italy. Preserving recipes is part and parcel of preserving a culture. Sometimes it is the only thing that helps distinguish one culture from another. Bob said his mother never made less than 2 lbs of pasta for any meal, even if it was only dinner for two! When I was growing up in Ireland and had the chance to go away on holidays when my friend Siobhan we would either don backpacks and stick out our thumb and hostel around the West of Ireland or go to France. France was easy as you could take a boat from Rosslare in County Wexford to Cherbourg or Le Havre. Getting to Italy required a little more planning and money of which the latter was in short supply. I never made it to Italy until last year (click on “Italy” to the right of my blog to read about my trip) so my introduction to Italian Food was in the States. I knew it had taken on a life of its own, as it should, but the essence was the same. It was all about big robust food centered around family. Bob had talked about his mother’s Sunday Gravy a number of times before I asked him what it was. I felt kind of silly that I didn’t know what it was, because when I thought about gravy it was brown, thickened with flour or thinned out with meat juices. 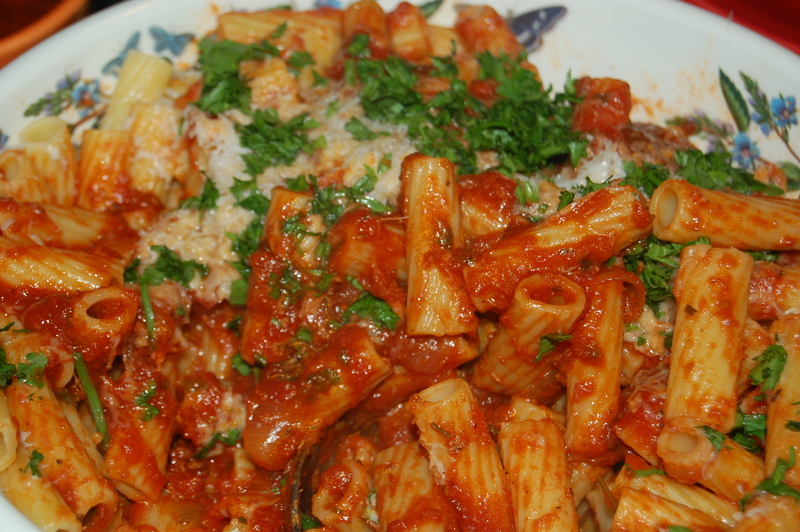 I was very far off the mark as it was Italian red sauce but essentially it served the same purpose as the gravy swimming on my plate every Sunday; it bound the food together and colored the flavor of everything you put into your mouth. I think Sunday Gravy is more important to Italian food than brown gravy is to the Irish kitchen (after all there is also White sauce!) and is the one component that every Italian or American-Italian has an opinion on. 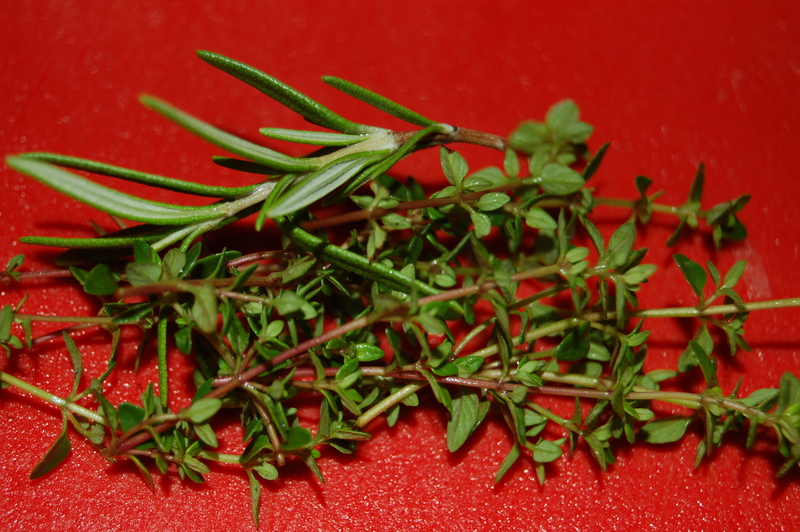 Some argue that garlic is imperative while others insist on fresh oregano or it just won’t be authentic. Bob’s Sunday Gravy is something I wondered about and the only way to taste it was to invite myself over to try it! Bob did not cook this dinner every Sunday, far from it. 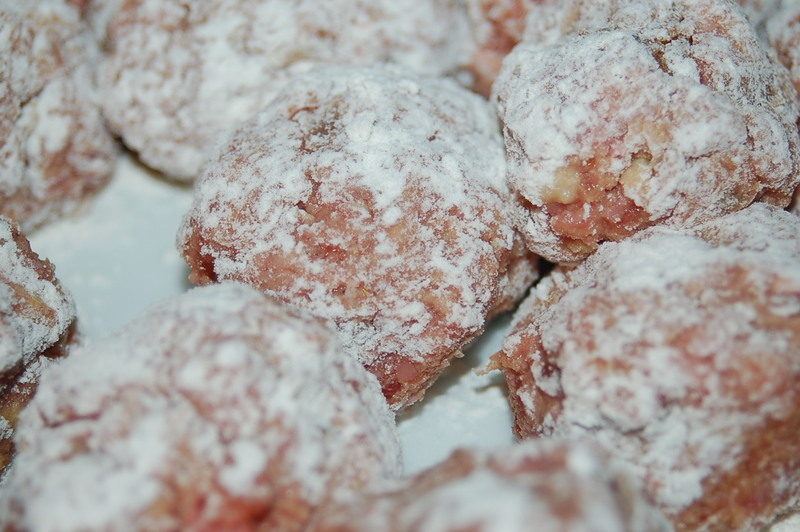 It took on a more celebratory status when he made it because he had to be in the kitchen for hours watching the pot, stirring regularly and making the other things that in Marie’s time were part and parcel of the meal; like her meatballs, salad, cheeses and herbs. People don’t spend as much time in the kitchen on Sundays as they used to because there are so many other distractions and obligations, so while Bob laughed at how excited we all were (well me for sure) about a meal he could have prepared with his eyes closed there was no getting away from the fact that it brought everyone together under one roof; the in-laws, the cousins and the Granny! The conversation drifted from food to family and back to food again. My mother-in-law wondered if having the smells of his childhood in his kitchen and all of the people milling around made him think about his mother and make him miss her? It didn’t seem so and I think he was comforted not saddened while going through the familiar motions of shaping the meatballs and checking the sauce. He was amused by my questions about how the sauce tasted to him, and if the Sunday dinner always has a bowl of ricotta cheese on the table, but I could see that he also enjoyed talking about the food and his mother and thinking about all the Sundays he spent in the kitchen with her. Up to that Sunday I had always wished I had met her, but now I feel a little like I did.